Dust in your house can look bad and also can trigger allergies for some people. Staying on top of it can help keep the dust form building up. This is a guide about keeping your house dusted. One day I noticed that you can follow the dust in my bedroom back to the air vent. I took two fresh dryer sheets, stapled them together, and covered the air vent with them using four refrigerator magnets. It catches much of the dust, so now I only dust about once a week or so, depending on how much the central air or heater is running. I picked up a small "auto duster". The large versions are called "California Car Dusters" and are used to dust the outside of the car in areas where there are water restrictions and car washing isn't allowed at the dollar store. It works better than the disposable dusting wands, and the dirtier it gets, the better it works. If it gets really bad, I take it outside and shake it out, then go back to dusting. It is treated with an oil to help trap the dust, so no sprays needed either. Source: I discovered this method while working in retail, and having to dust hundreds of square feet of shelving very quickly. 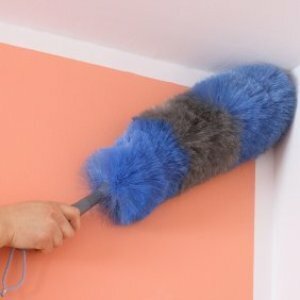 Go to your local dollar store and buy a hand duster (meant for dusting tables, etc.) Walk to the top of your (non-carpeted) stairs. Holding the railing with your free hand, back down, dusting as you go. I dust from the right side of each step to left and then give a little flick downwards. Very easy on your back, safe, light in your hand to hold, quick and efficient. When you get to the bottom, just tap your duster to get remaining dust out of it, then wisk up the dust with a dust pan. I've been using the same duster for about 3 years now and it still works like a charm. SO much easier than lugging a vacuum up and down the stairs. I found using a broom just blew the dust down and was dangerous because I needed both hands to sweep and easily got off balance. They are only $1.00, worth giving one a try. You'll love it, promise. I have yellow dust throughout my whole house. It even turns my carpets yellow. If you spray the carpet with water it makes it white. But it is not just on the surface of the carpets. It took me 13 hours to scrub 2 rugs until the yellow was all gone. I scrubbed them with a brand new steam cleaner that heats the water and I put hot water in the machine. My hot water gets to over 130 degrees. I don't usually open my windows. I really do not think it is pollen. I cleaned everything in November and have not opened my windows since then, and everything still is turning yellow again. No one wears shoes in my house, so it is not from outside. The dust is on everything. My heating vents have been cleaned twice in the past 5 years. It didn't help at all. I have also had my rugs professionally cleaned and that didn't help either. I want to know what it is and what causes it? It drives me crazy that I clean the whole house so well and no one wears shoes in my house, yet the white carpets I have look dirty because of this yellow stuff - whatever it is. I have enclosed a picture of my white carpet when I moved my couch. 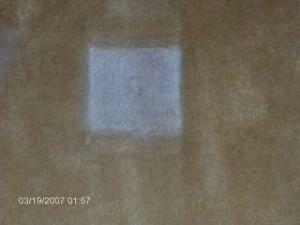 You can see it is white where the legs of the couch sit, and where I went over it with a steam cleaner. Where most people walk, it's not so yellow because it comes off onto people's socks. I do not have any plants in my house. I am a very bad gardener and can not keep anything alive. Wow, SherryLynn! I don't have a clue what the yellow dust could be. Have you spoken with neighbors to see if they have the same problem. My concern is that if it's all over the house, then it becomes a health issue because you are breathing it, too. Could it be something the house itself is "shedding" or giving off. I honestly can't even imagine what it can be but I think you should try to find someone to analyze the dust. God bless you and help you to find a solution. Oh also no one smokes in my house. And it is not stains from a pet. When I had my vents cleaned I asked them about it, and they looked at me like I was crazy. I went over a spot on that rug over 20 times and it looked clean. Until the next day that is. I am going to replace that carpet because I don't want to spends days or even weeks scrubbing it. I was thinking maybe it could be my carpets? I will soon know when I buy a new rug from a different place. Any advice? Do you have gas heat? Do the walls change color, the ceiling, or just the floor? It sounds as if natural gas is leaving a residue when being used, this happens a great deal in older heating systems even though the duct work is cleaned. I'm wondering if you live near some sort of refinery or mechanical plant where they fire things. Maybe it's residue from something nearby. You should call your local health department and ask them about it the air quality in your area. 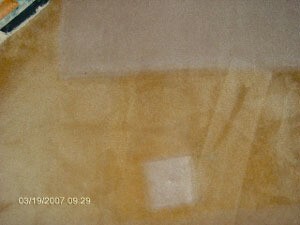 Do your carpets have a rubber back? 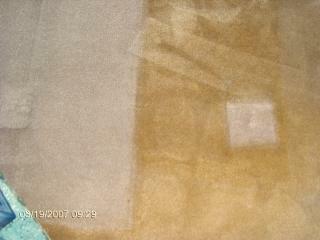 Sometimes when carpets get old the rubber back turns yellow and crumbles into dust. This could be the problem. Shampooing your carpet may make the problem worse. Try to pull up a corner of the rug where no one will see it and check. The corners may not show it because they have had little or no traffic. But I would try to get to a well used part of the carpet and check. Hope this helps and keep us posted on how you make out. wow. that is surely more than pollen. yes i agree call your agriculture office or the like. ask them if other people have this problem. if it is dusty it could be in your air and therefore breathing it. that is very strange. Wish I knew what to tell you. I have a small country store which had the same problem when we bought it. Since then, we have insulated the attic and walls, new wall paneling, new carpet, less windows, probably better sealed doors, new heating and air conditioning and vents. No more problem! Maybe things need to be sealed up better in your home--good luck. I hated that junk and it bothered my breathing. Could it be spores from some kind of fungus? I didn't see anything about when you bought the carpet or if you did buy the carpet. I tend towards the breakdown of the carpet pad as an answer. Pollen usually causes other problems and not just carpet color changes. I also think you should talk to the health department because this does sound like a biohazard of some sort especially if your breathing is affected. The suggestion to talk to an Ag college is good, too-- especially if they have a biohazard degree. They might be interested enough to do an analysis. The carpets are 3 and 5 years old, and none have rubber backing. At first I thought it was the white carpet, and they even replaced it. Then when I scrubbed my green rugs and the water was yellow I saw that was not the problem. I do have natural gas but in the basement were the furnace is nothing is yellow and the carpet down there is not yellow. The walls and the ceilings do not turn yellow. The house is very well insulated. I have very high ceilings and in the winter my heating bills are like nothing. No one in the house has any trouble breathing of has had any trouble breathing. I live by a ford stamping plant, but I'm not sure if they burn anything. I was thinking could it maybe be the stuff you sprinkle on your rugs before you vacuum-like carpet fresh? Also I have used electric potpourri pots with liquid potpourri for years. I threw all on them out, and I am not going to use them ever again. On my fireplace where I had a potpourri pot its yellow. So maybe this is the problem. Any one use these pots with liquid potpourri? Thank you all for all the input and feedback. It is really helping me. Thanks so much. DO YOU BURN A LOT OF CANDLES? i HAVE BEEN TOLD SCENTED CANDLES LEAVE A RESIDUE BEHIND. YES I DO BURN A LOT OF CANDLES. THEY ARE ALL YANKEE CANDLES.